Ryman Auditorium was bustling with talent on Wednesday night (April 3). The iconic venue was host to a benefit for Thistle Farms, which is a local nonprofit organization that benefits female survivors of abuse and trafficking. Brandi Carlile headlined the event, called Love On Fire: An Evening with Thistle Farms, and featured performances by Levi Hummon, Ruby Amanfu, Shemekia Copeland, Inversion Vocal Ensemble, and a special appearance by John Prine. “Tanya Tucker is punk rock. She’s had those moments in life and come through them…she’s probably one of my favorite country singers ever,” she said. The respect is mutual, seeing as Carlile co-produced Tucker’s upcoming album While I’m Living, along with Shooter Jennings. 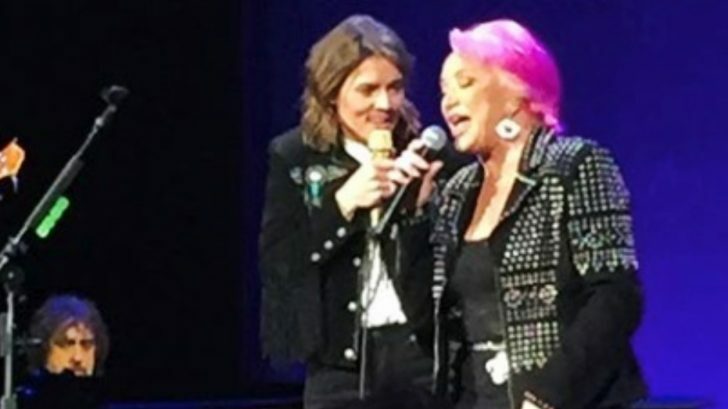 The two debuted the title track at Loretta Lynn’s All-Star Birthday Celebration on Monday night (April 1). She counted them in, and they sang the opening lyrics in spine-tingling harmony. Before you knew it, the audience was on their feet and clapping along. By the end of the song, the whole Auditorium was standing, singing along, and clapping loudly. And to think, this was all a surprise!